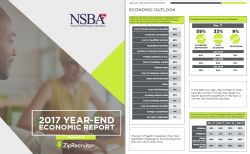 Washington, D.C. – NSBA and ZipRecruiter today released the NSBA 2017 Year-End Economic Report, which shows decade-highs in small-business outlook. For the first time since 1997, the majority of small firms—53 percent—reported increases in revenues, and the overwhelming majority—84 percent—are confident in the future of their business. About NSBA: Celebrating 80 years in operation, NSBA is a staunchly nonpartisan organization advocating on behalf of America’s entrepreneurs. NSBA’s 65,000 members represent every state and every industry in the U.S. Please visit www.nsba.biz or follow us at @NSBAAdvocate. About ZipRecruiter: ZipRecruiter is the fastest-growing online employment marketplace. Powered by industry-leading artificial intelligence matching technology, it connects millions of SMBs and job seekers through innovative mobile, web, and email services. Founded in 2010, Santa Monica-based ZipRecruiter now has close to 1000 employees in two states and three countries.